In the late 1970's, my dad took a second job working at JFK airport. He washed pots and pans in the food service department for Lufthansa. As a little girl, no more than 4 years old, I recall going to visit my dad to take him lunch or pick him up from work. He always brought me around to his co workers in the other departments to show me off. One department that always fascinated me was what I called the goodies section. This was the department where they kept the cases of little bags of peanuts, sodas, mini liquor bottles, wing pins and anything else they would stock on the airplane for passengers. This was a giant cage full of colorful boxes, which we could not enter. Instead, we would walk to a little window and speak to a little man on the other side. This man was Edwin, and he was my dad's best friend. If a case came damaged, they had to discard it completely, so Edwin would tell my dad to stop by with me if they had any opened cases. He always had goodies waiting for me when we'd arrive. Sometimes it was little bags of peanuts. Other times it was little bags of Haribo Gold gummy bears. I loved those best. On one such visit I was greeted with a major surprise. Seems like Lufthansa had some kind of promotion with a toy company in Germany called Siku. Siku produced a bunch of diecast cars and little planes to give to children traveling on their planes, much like the pilot wing pins usually seen. So that night, I came home with an armful of little blue Porsche cars. The cars were wider than your typical Matchbox or Hotwheels car, but they were relatively the same length. An added feature: the doors opened. Like many children of the 70's, I had a vast collection of cheap giant plastic trucks and cars, but these little blue cars were small, heavy and rolled like a dream. I spent many an afternoon racing those little blue cars on kitchen linoleum, living room plush carpeting, and freshly laid sidewalk cement by myself. They were the first metal toy cars I ever owned, and I loved them. As I got older and started playing with other children close to my age, I would bring them out. No one ever seemed impressed by them. 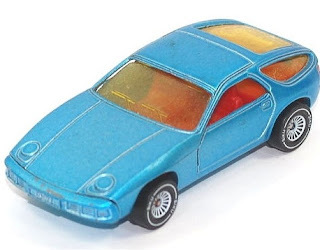 In the sea of brightly colored Hotwheels and stylish Matchbox cars, a fleet of light blue wide porches that were an off-brand (by American childhood standards) was something to be ridiculed for. After a while I stopped bringing them out to play. They languished under my bed like exiles, only to see the light of day when I was forced to clean my room. One solitary car survived the many purges of childhood... with rust stains, paint chipped, wobbly wheels, and cracked windshield. Much like a real neglected car from the 70's.